Does your lawn need a little extra love this season? Save some cash with these killer lawn mower sales happening right now! It’s officially that time of year when you need to tend to your lawn. From your backyard to your front yard cutting your grass is typically a weekend commitment. While it may take up most of your time, it doesn’t have to. Maybe you need a major upgrade to your lawn mower this season? You’ve come to the right place. You don’t have to wait until the winter or the end of fall to save some cash on a mower. Most of the major home improvement retailers (yes, we’re talking The Home Depot, Lowes and even Walmart) are running killer sales all throughout the year. Even in the fall! Jump right to the best lawn mower reviews here! Jump right to the lawn mower coupons and sales here! 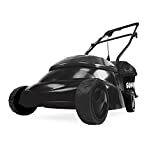 Whether you’re looking for a simple push mower, the ultimate riding lawn mower, an electric option, the standard gas powered option, we’ve got you covered. Bookmark this page because we’re updating sales and deals on a regular basis all throughout the month! Happy lawn, happy wallet, happy you! It’s currently one of the best-sellers on Amazon today (and who doesn’t love free shipping!?). We love that this one has rear wheel drive, which will totally come in handy when you’re trying to mow down tall grass/weeds or trying to tackle hills. You can bag the clippings if you’d like with this mower or even mulch it (don’t worry it can still toss it out the side if you don’t want to bag or mulch, you rebel!). Learn more here! This option is perfect for those of us who don’t have ton of space for storage. It takes up 70% less space than most other comparable mowers because you can store it upright with a simple fold, lock, and store option (see below). Beyond how amazingly compact this one is, it also packs a punch for your grass too. It has both rear wheel drive and self-propel so you can let this beast do the majority of the work instead of you (and your back!) Currently Toro is America’s #1 selling mower brand! Learn more here! Why cut the grass yourself, you know, like an animal? Let this efficient robot do it for you! It has smart navigation and will stay within the setup boundaries, can work even in rain (unlike us), will return back to its charing station when it knows it’s time for a charge, and can work on slopes and inlines of up to 40%! At first it will have to go through its “Get To Know Your Yard” phase, but then you’ll be good to go. Learn more here! This is one of our favorite cost effective (read: cheap) options this season. It doesn’t skimp on quality either, which is the most important part. It’s cordless, battery charged, and has around 45-minutes of total run time on a full-charge so it’s perfect for those of us who have an average-sized yard and not acres upon acres (read: Oprah). Plus, it folds up easily for compact storage too, which is so nice. Learn more here! If you’re looking for a high-quality multi-function option that’ll run you less than $250 (currently) this just may be the best option for you. 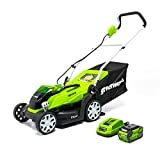 It’s gas powered, can bag, mulch, or just shoot out the clippings, and has 6 position height options so you can decide if you want your grass cut super short, a but longer, or whatever your preferences are. This one currently has been rated 4.6 out of 5 stars by customers who recently purchased it. Learn more here! 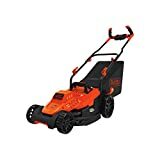 The Home Depot is having an amazing lawn mower sale this month and you can save up to 30% off (many with free-shipping options). The sale list is pretty endless, but you can select mowers from Ryobi, Toro, Beast, John Deere, Honda, Ego, and more. Whether you're looking for a walk-behind mower, a ride-on mower, electric, gas powered or old-timey mower HD has you covered this month. Make your lawn a happy lawn! Ryobi is having a moment this season and Home Depot has selected some of their best sellers and slashed prices. Right now you can save up to 30% off select Ryobi lawnmowers (push, self-propelled, walk-behind). A lot of these also qualify for free-shipping! How can you go wrong with that?! Still trying to figure out which lawn mower you need for your backyard? 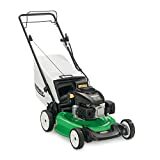 Choose from some of the most popular mowers at Home Depot and save upwards of 33% off the regular price. Choose from Ryobi, Honda, Beast, Toro, and more. Get your ride-on lawnmower/tractor at some of the best prices of the season. Some of these ride-ons are 10% off which, at the regular retail price, is really a great sale price. Check out the ones from John Deere, Cub Cadet, Poulan Pro, and more. Ready to go the electric route this spring and summer? You're in luck because this month Lowes is lowering the prices on select electric push mowers. Save up to 20% off the regular price and choose from trusted brands like Kobalt, Greenworks, Black + Deckers, and more. 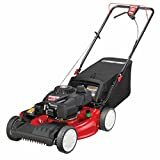 Looking for the ultimate deal on Troy-Bilt lawnmowers? Look no further! 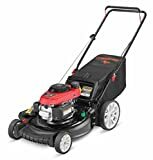 This month you can get the best deals on gas powered Troy-Bilt push mowers at Lowes. We even spied one for as low as $199. You really can't go wrong with this brand! Right now there's a killer lawn mower sale going on at Walmart. 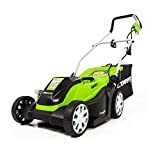 For a limited time you can save up to 25% off these select name brand lawnmowers. Choose from top-sellers from Black + Decker, Snapper, Troy Bilt and more. 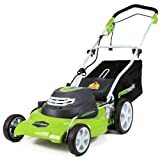 We even spied a ride-on mower by Snapper for over $800 off the regular price!